The Le Chef Patissier French Raspberry Tartlets are delicious raspberry tartlet cookies made from a French recipe with real fruits. How to describe the taste of these raspberry tartlets? Savory and irresistible. For me, it has been hard to eat just one. The raspberry tartlets are made with real fruits. The tartlet filling mainly consists of raspberry, apple, and passion fruit puree and juice. You can see the complete ingredient list in the product review below. Le chef patissier is a French company. Located in a little town called Avranches near Normandy, France. It is a family-owned business and they focus on making delicious cookies with the best ingredients. And it is easy to taste that philosophy from just one bite. What I like about these raspberry tartlets from Le Chef Patissier is that they are very focused on retaining the freshness of these cookies. Since there are no preservatives or artificial ingredients, they have packed the tartlets individually. You can see what the individually packed tartlets look like in the product review details below. The raspberry tartlets are made with no hydrogenated fat or palm oil. Each raspberry tartlet offers a sweet and savory burst of flavor. That flavor is followed by the delicious and fresh tartlet crust. I really enjoy snacking on these Le Chef Patissier raspberry tartlets. I think these raspberry tartlets are perfect for an afternoon tea, or evening snack. Very enjoyable and delicious. The raspberry filling in the middle is not overwhelming. It tastes very natural and light. Bring a bit of a French confection to your life today with these individually wrapped raspberry tartlets. Looking to Purchase Le Chef Patissier French Raspberry Tartlets? Already made up your mind? Amazon currently has this item (larger quantity than the item reviewed here) in stock at the best price with shipping included. Shopping for the Best French Cookies and Snacks? The Le Chef Patissier French Raspberry Tartlets is obviously a wonderful choice. I would also recommend Bonne Maman Raspberry Tartlets if you are looking for mini raspberry tarts similar to Le Chef. Item name: Le Chef Patissier French Raspberry Tartlets. La tartelette a la framboise. 4 individual boxes of 4.76 oz for freshness. Each box contains 9 individually wrapped tartlets. 19.04 oz (540 g) total weight. Ingredients: Sugar. Wheat flour. Concentrated butter (Betacaroten coloring). Raspberry puree and concentrated raspberry puree. Invert sugar syrup. Concentrated apple puree. Eggs. Concentrated passion fruit juice. Gelling agent: Pectin. Natural raspberry flavor with other natural flavors. Salt. Concentrated grape juice. Citric acid. Le Chef Patissier French Raspberry Tartlets contain wheat, milk, and eggs. The product may also contain traces of soy, sesame, and tree nuts. 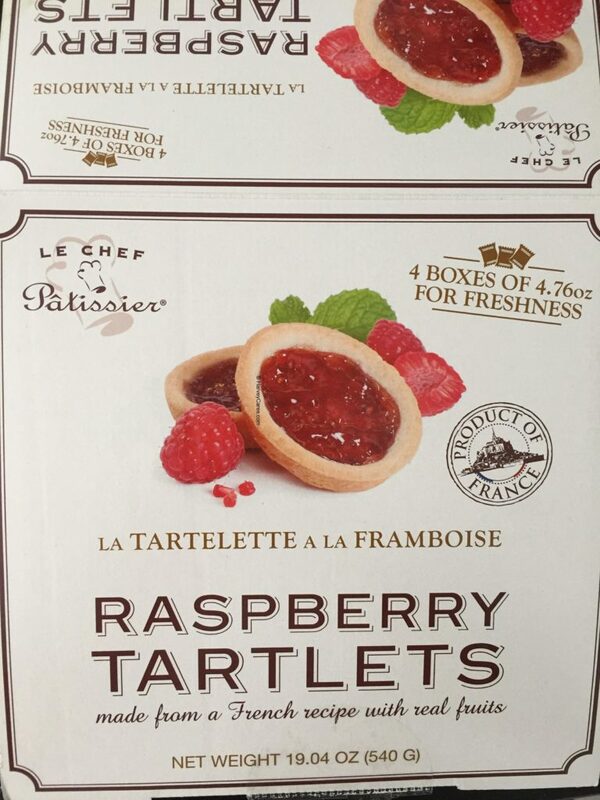 These delicious raspberry tartlets do not contain any hydrogenated fat or palm oil. 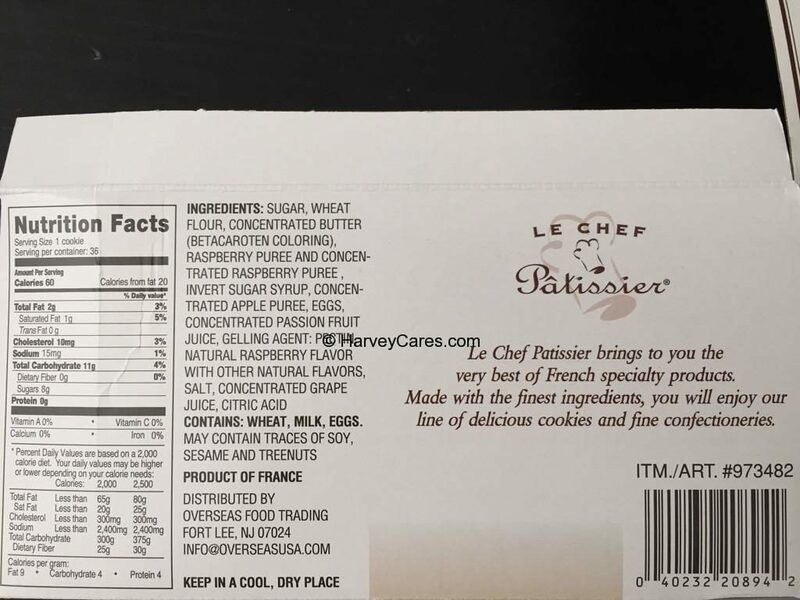 The Le Chef Patissier French Raspberry Tartlets serving size is 1 cookie (1 individually wrapped raspberry tartlet). There are about 36 servings per container. 60 calories per serving. 20 calories from fat per serving. 4 individual boxes of 4.76 oz. Each individual box has 9 individually wrapped tartlets. Keep the raspberry tartlets in a cool and dry place. The raspberry filling may become a bit runny if it’s directly under the sun or gets too warm. I took out 2 raspberry tartlets from one of the boxes. You can see that the raspberry tartlets are nicely and individually wrapped. About two or three bites and you would finish a Le Chef Patissier French raspberry tartlet. So don’t judge me because I usually can’t resist and have at least a few in one sitting! 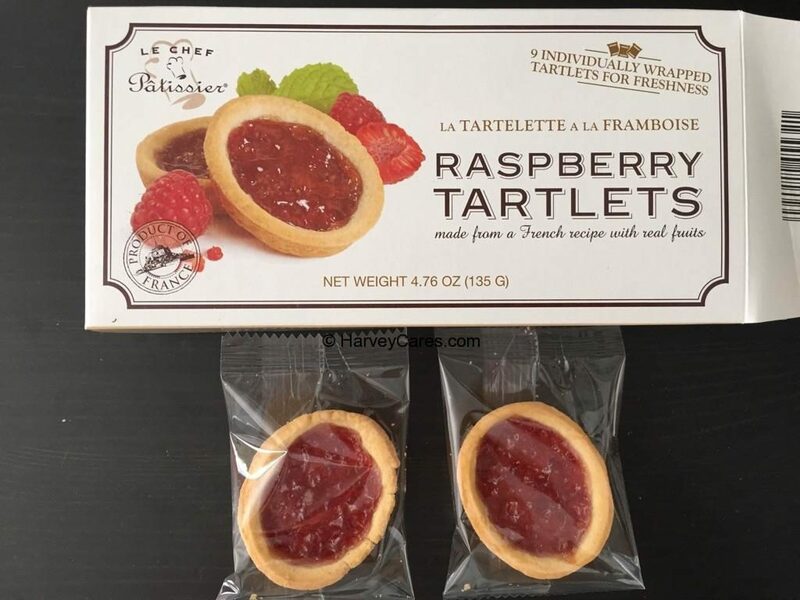 You can see the actual view of the raspberry tartlets below out of its packaging below. 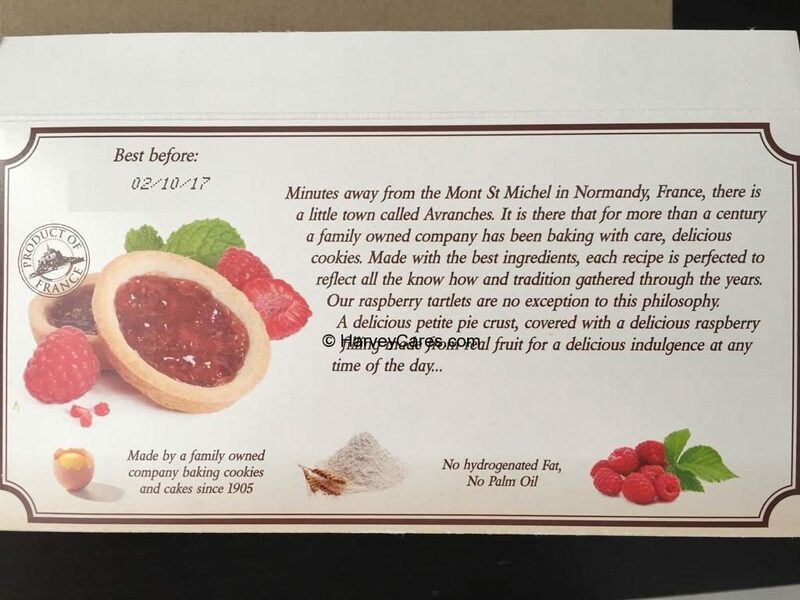 You can see that the actual tartlets themselves are very similar to the picture in the packaging. What you see is definitely what you will get! And it tastes even better than it looks. Each tartlet is fresh thanks to being individually wrapped. Le Chef Patissier French Raspberry Tartlets are made in France. The company is Le Chef Patissier and they are a family-owned company. They have been in business for over a century. Le Chef Patissier focuses on baking delicious cookies with care. They use the freshest ingredients and follow traditional recipes. The result of this philosophy is delicious pastries that you can indulge in. 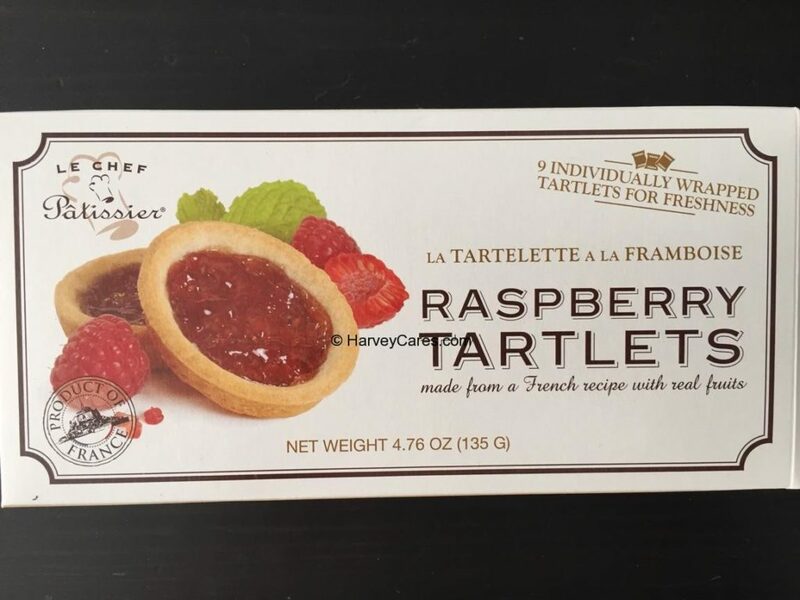 Get a bit of la tartelette a la framboise in your treats! Below is a snippet of Le Chef Patissier French Raspberry Tartlets and the company’s background. From the back panel of the cookie tartlets. 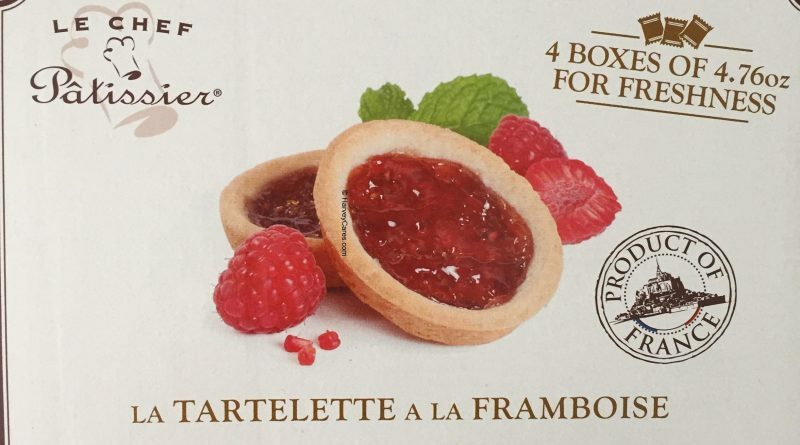 The Le Chef Patissier French Raspberry Tartlets was selling at my local Costco Warehouse for $14.00 but is not available anymore (seasonal item). Amazon.com appears to have the best price for this item with shipping included. Have you tried this French dessert before? Share your thoughts below! A truly delicious, buttery cookie.